First line indentation. The readability of a contract considerably increases by a proper paragraph indentation. For the layout of articles, sections and subsections, the most commonly used format (in European style) is ‘hanging indent’: the number of the paragraph stands out of the text of the paragraph (and the first line starts on the same indentation as the subsequent lines of the paragraph). This principle is applied consistently: each additional level indents an extra 1 cm. The result is a neatly staggering paragraph structure. U.S. style (hanging indent). In U.S. style contracts, drafters need to work with the larger unit of the half-inch (1.27cm). 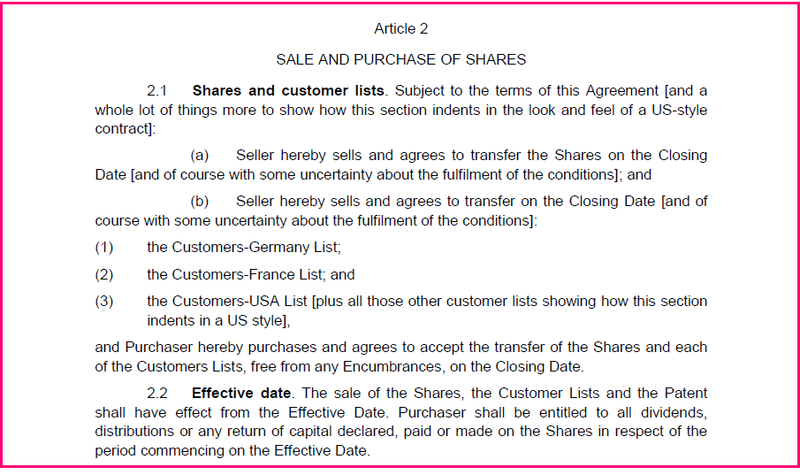 It may be the reason why those contracts often use hanging indents (also increasing the density of the text on pages). An advantage of the hanging-indent format is that enumerations in subsections more easily read as a continuation of the lead-in section. For the avoidance of doubt, the above indentation style is not endorsed by us.